"We write what we live and we live what we write, is that wrong? Well, if you think it is, Mr. Music Executive, why don't you write your own songs." You know, one of the coolest things about country music is the collaboration record, or duet song. Now, I'm not trying to play the CMT version of Stump the Band here, but I defy anyone to tell me that any other form of music has had more successful pairings of established artists joining forces, not only commercially, but in terms of quality, too. Prop yourself beside the jukebox of time and think back: George and Tammy. Kenny and Dolly. Faith and Tim. Johnny and June. Willie and Waylon (and the boys). Most recently, Country Hall of Fame shoo-in Alan Jackson and Jimmy Buffett harmonized on that positively blue-collar anthem, It's Five O'Clock Somewhere (and you know, it is). However, in the category of silver screen twosomes, Nashville's track record doesn't necessarily send anyone into a fit of pickin' and grinnin', but it sure isn't for a lack of trying. Reaching into my DVD grab bag of best-case examples, I present Songwriter, a raggedly rousing musical comedy that's trickled into unjust obscurity since its 1984 unveiling. Did you know that back in the day this Alan Rudolph-directed critical fave was Oscar nominated alongside the ranks of Purple Rain and The Muppets Take Manhattan for Best Original Song Score? Probably not (unless you're auditioning for Relentlessly Rare Trivia Week on Jeopardy!). 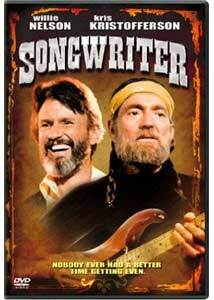 Willie Nelson and Kris Kristofferson blend perfectly for this alternately blunt and often times wickedly funny kiss-off to money-grubbing music industry fat cats whose only talent consists of swindling unwise tunesmiths out of royalties through any means possible. Portraying two-thirds of a Peter, Paul and Mary-like trio (albeit a countrified version with Melinda Dillon as the pretty one in the middle), times are good for Doc (Nelson), Honey, and Blackie (Kristofferson) during their day in the sun—until Doc and Honey decide to continue their collaboration as man and wife. Oh but hey, it's not a case of jealousy on Blackie's part. But when Honey leaves the "recording session, series of one-nighters and repeat" routine behind to play housewife and mama to two daughters while Doc continues gallivanting on the road, it's leavin' time. Quicker than a slide moving up the fret board on a pedal steel guitar, Jenkins chalks up marriage No. 2 to brunette cutie Anita (Shannon Wilcox), but that dissolves faster than a DJ's copy of D-I-V-O-R-C-E accidentally spun at 78rpm. Could things get worse for this outlaw poet? Mmm hmm. Bad investments (a German fried chicken place?) and shady handshake deals that return to bite him in the rear on top of a double dose of back alimony to fulfill. Not surprisingly, Doc decides to exchange the nightlife grind for that of a music mogul. For a bit, things are good: profitable publishing, his own recording studio, and incognito session musician work keep the bills paid. Halt the happy fiddles and banjos, though; Rodeo Rocky (Richard C. Sarafian), whom Doc sold his company to, takes advantage of a handshake deal to assume complete control of all aspects of Cowbird Music. So it's not just marriages that Jenkins is batting 0 for 2 in. Determined to come back swinging, Doc enlists Blackie's help in plotting just desserts for all that have screwed him over, something his old buddy is experiencing first hand nowadays. Thanks to scrupulous promoter Dino McLeish (Rip Torn), Blackie's touring schedule gets re-routed to make him look bad, a "last straw" move setting cogs in motion for a multi-layered revenge fest including the help of a promising female vocalist (Lesley Ann Warren) that may put Doc's songwriting fortunes back in the green. Though shy of perfection, Songwriter's dead-on view of the darker side of Music City record industry politics is balanced with a engagingly wacky, almost screwball comedy-in-nature feel courtesy of Bud Shrake's funny screenplay that fits perfectly with Rudolph's off-kilter directorial propensity that's served him well in equally underrated gems like Roadie, Choose Me and Made in Heaven. Superior as these aspects of the movie are, Songwriter's success is due to the ever-welcome presence of Willie Nelson. Bringing the same relaxed charm and appealing warmth of his stellar recordings to his acting, the country music legend defines the term "natural"; there are moments in this film that you'd swear came from a documentary (and after a then over 30-year career, Nelson certainly had a backlog of real-life instances to draw upon). Equally appealing is that silver-tongued devil himself, Kristofferson, who's not too shabby in front of the camera himself, which only enhances his effortless, smooth chemistry with Willie. Stellar support from Torn (who has the patent on playing sleazeballs), the endearing Warren (who does her own singing, by the way) and one of the most unsung character actresses of the time, Melinda Dillon as Doc's first wife. Longtime fans of Nelson will have fun recognizing many members of his legendary Family band (harmonica player Mickey Raphael, Paul "The Devil" English, guitarists Jody Payne and Grady Martin) as well as big name friends including Booker T. Jones (producer of Nelson's hallmark Stardust album), fiddle great Johnny Gimble, and Billy "I Can Help" Swan. Speaking of the music, the soundtrack features some real gems from the Redheaded Stranger including Why Don't You Write Your Own Songs, a blade-sharp ode to heartless movers 'n' shakers, and the stark, lovely Who'll Buy My Memories (apparently performed live on the set) that ranks with Nelson's best. Unfortunately, Kristofferson's material doesn't receive the same treatment, with most of his soundtrack contributions melded together in a medley that comes off llike an extended director's cut of those two-minute mail order album commercials. That's a shame because songs like the rocking Crossing the Border and Under the Gun more than live up to the standards of Me and Bobby McGee and Sunday Morning Coming Down. Image Transfer Review: Those who collect a lot of Columbia's mid-1980s film fare know that the visuals sometimes leave a lot to be desired. That's what makes Songwriter such a pleasant surprise, considering its cult status. Looking prettier than a blonde-haired, blue-eyed cowgirl sitting on a barstool glowing under nearby neon lights, this natural, colorful transfer is a keeper. Almost devoid of barely noticeable discrepancies, I can almost see the bonfires of old VHS copies and laser discs commencing at celebratory backyard barbecues. Audio Transfer Review: Though it would have strongly benefited from a 5.1 re-mix, this well-produced original Dolby Surround soundtrack still comes off impressively in 2004. Low bass is slightly wanting, but the wide stereo that emerges from the fronts and fine back-end ambience will please music lovers during the concert sequences. Extras Review: When you consider the film's music industry storyline and the careers of its co-leads, Songwriter could have been the basis for one heck of a commentary track, or at least a featurette (not to mention full-length versions of those great Kristofferson songs noted earlier). Instead, a trio of trailers for vault offerings is all that's offered. Impressive video re-mastering with warm and vibrant audio make Songwriter's DVD debut a pleasant surprise. Highly recommended for Willie Nelson and Kris Kristofferson's large fan bases; a "without hesitation" rental tip for those seeking an appealingly left field slice of entertainment.